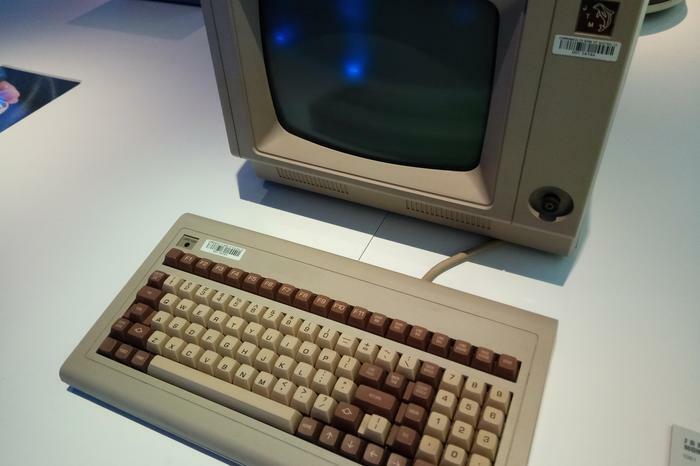 The Commonwealth Bank of Australia has marked the 50th anniversary of its first computer — an IBM mainframe — with a three-day event beginning 28 November that celebrated its IT history while looking at how CBA can leverage emerging technologies. The bank’s ‘Amaze’ event was held in its Darling Harbour office. 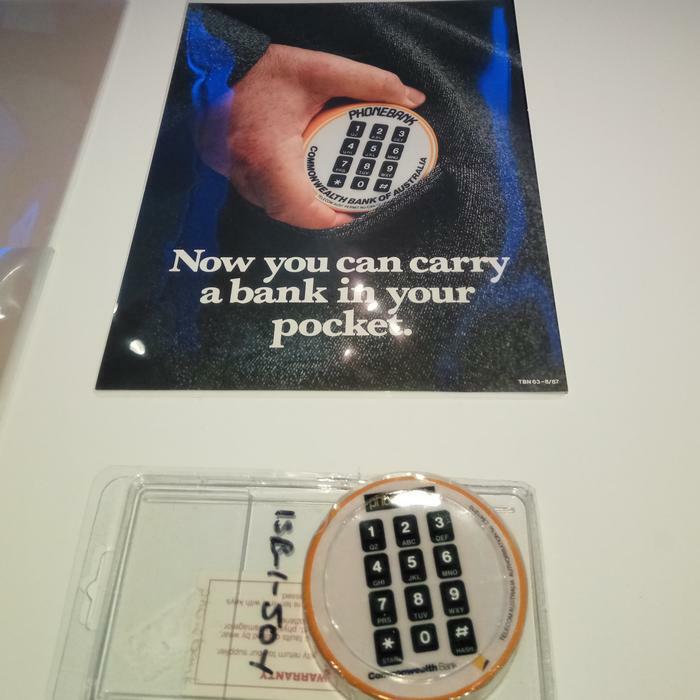 In addition to an exhibition of technological artefacts from the CBA’s history — ranging from the IBM 360 operator control panel to the Triton Systems ‘ATM Jr’ device used in the 1980s to train customers to use automated teller machines — it featured a series of talks looking at the bank’s engagement with emerging tech, including quantum computing, blockchain and mixed reality. The event culminated in the announcement of the winner of an innovation challenge that saw employees pitch application ideas that could use Microsoft’s HoloLens mixed reality headset (the winning idea was a training application for the bank’s staff), followed by an address from the bank’s chief information officer, David Whiteing. The bank is currently staging two additional ‘innovation unleashed’ challenges focussed on youth banking and future workplaces, and will hold a further challenge in January centred on the use of drones. The HoloLens challenge finalists were individuals from disparate parts of the bank, ranging from accounts payable to staff learning and development. Innovation “isn’t any one person’s responsibility or a group — it’s a collective responsibility,” Whiteing said in his closing address to the event. “If we don’t actually innovate, that’s going to be that thing that will stop us being relevant in the future,” the CIO said. He called for a “generous orthodoxy” that is grounded in the bank’s history but capable of embracing new ideas. He cited as an example the adoption of the bank’s mobile app which is “fast becoming our orthodoxy,” as more customers use it as their main method of interaction with the bank. Key to ensuring the bank remains relevant is having an innovation mindset, the CIO said. “The things that I think about in the context of innovation, thinking about the future, making sure we’re relevant — they’re actually very little about the technology aspects and are much more around the cultural and mindset aspects,” he said. Partnering has a crucial part to play in innovation as well, he added. Changes to the operating model within the bank’s technology function also play a role, the CIO said. Whiteing has previously outlined his vision of “platform teams” that act as self-directed consumers of infrastructure services. “We’re innovating the way that we’re organised and the way that we’ll work together in the future, so that a large bank with a large technology capability and operations capability is essentially, through the platform model, being broken down into a series of mini-businesses that have accountability and have autonomy to get things done but are very much in alignment,” the CIO said. “It’s something that we’re thinking about and implementing to create the environment that allows us to continue to innovate,” he said. Another element of innovation is the bank’s investment in people, Whiteing said, adding that it was not just a question of investment in technical skills such as coding but also “higher order” attributes around problem solving, persistence, and openness to a process of continuous improvement. 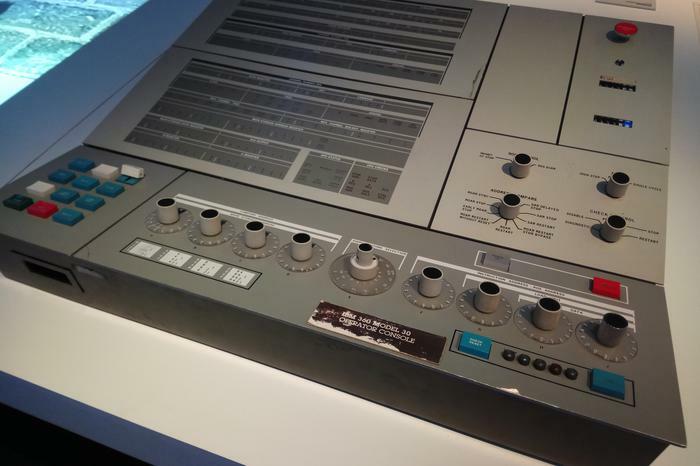 Operator control panel from the bank's IBM System/360 Model 30, which was installed in 1966. 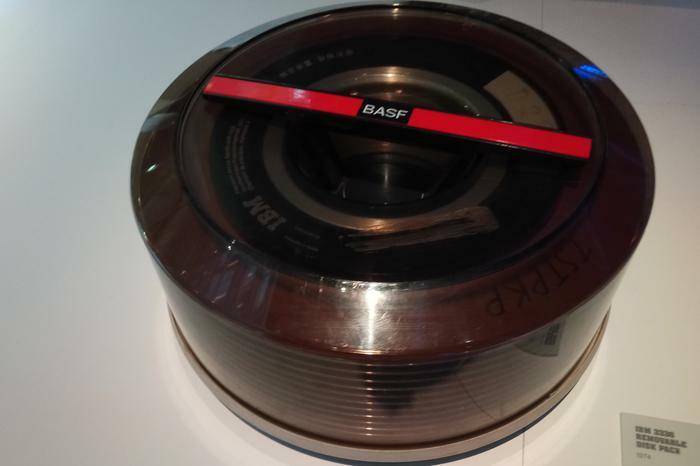 IBM 3336 removable disk pack from 1974. 200MB of storage! 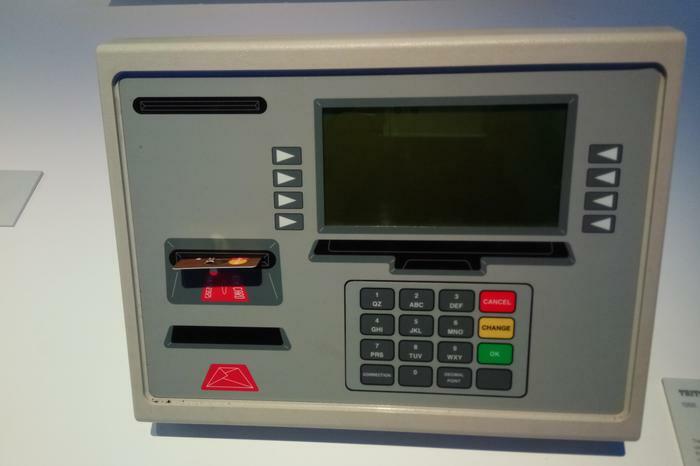 Triton Systems ATM JR: A battery powered device from 1986 used to train customers in the use of ATMs. CBA PhoneBank from 1987. The PhoneBank service allowed people to pay bills and organise payments to more than 1500 organisations through a telephone receiver attachment. 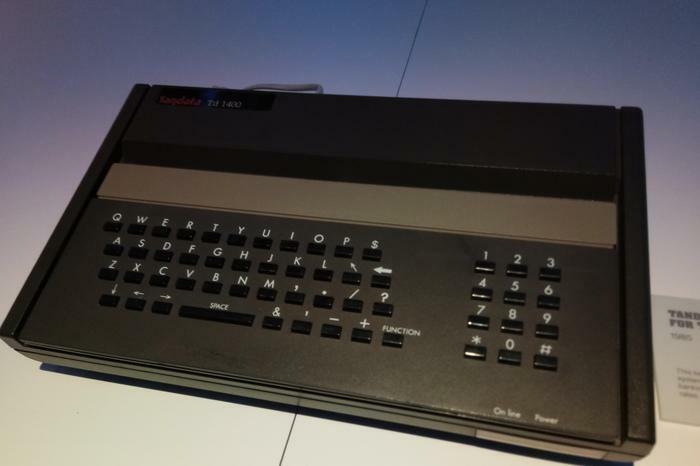 Tandata keyboard for Telecom Viatel System from 1985:The Telecom Viatel Videotex system was used by the bank in the 1908s for a home banking service. Customers could check account balances, transfer funds and pay bills, as well as check interest and forex rates. 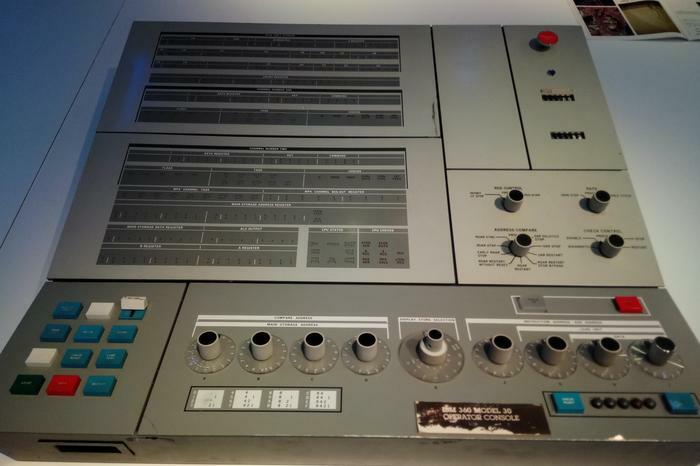 Monitor and keyboard for the Dolphin computer rolled out in branches beginning in 1981, initially to help with accounting. Prior to the Dolphin, accounting in branches was performed manually. 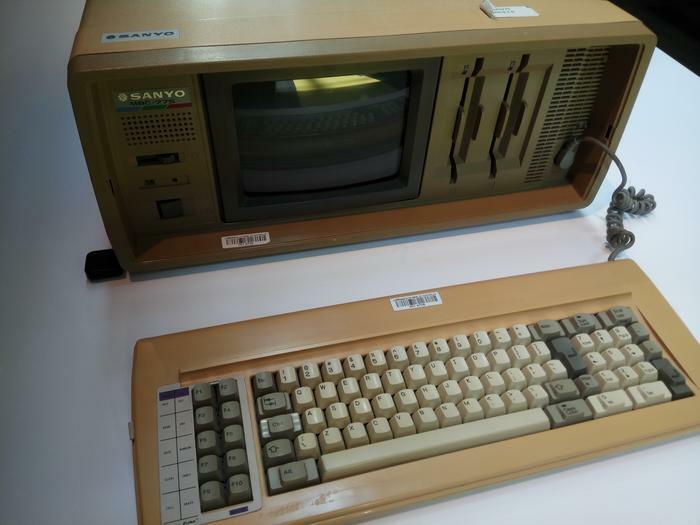 A portable Sanyo MBC-775 PC from 1986. The PC was used to demonstrate Micro Treasurer, a cash management application sold to corporate clients of CBA.